In a frying pan, blanch the asparagus in boiling salted water for 2 minutes. Drain, set aside. Wipe the frying pan dry. In the same pan, saute mushrooms in butter until soft. Season the mushroom with salt and pepper. 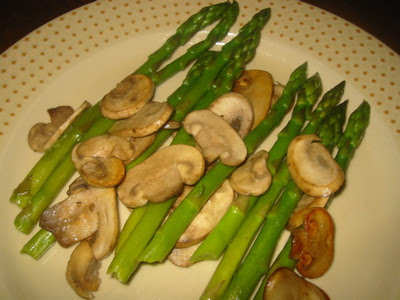 Put the asparagus back into the frying pan, mix them with the mushroom until just combined. Transfer to a plate and serve.